It only takes a few plants to cast a tropical look upon a garden. Although our gardening zone here isn’t strictly tropical, it’s still possible to include some tropical and tropical-looking plants in our landscapes to create a lush summer oasis that hints at a vibrant paradise. 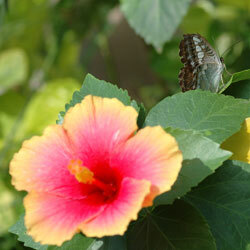 A simple way to add a tropical touch to your garden is to place houseplants among your outside ornamentals. As many of our houseplants originated in tropical, semi-tropical or desert zones, they’re right at home in the summer garden. 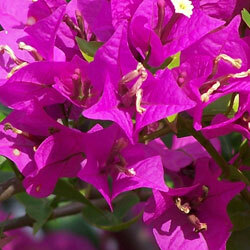 Consider the effect of adding spathiphyllums, orchids, ficus or cacti to your garden or patio. A brugmansia (sometimes called datura), with giant drooping, fragrant flowers epitomizes the idea of “tropical.” Potted citrus trees produce fruit and fragrance. A “tree” of tillandsias (air plants) creates an amazing sculpture. A single large stag-horn fern hanging from the side of a sturdy shade tree is another eye-catcher. When summer ends, simply shower the plants, look for insects and treat if necessary, and reinstall them in the house to provide winter enjoyment. Many beautiful bulbs can add a tropical vibe to your garden with very little care or maintenance. Here are a few of our favorite summer bulb additions to the tropical garden, but remember that these plants are not winter hardy here and the bulbs must be dug up and stored inside for the winter. 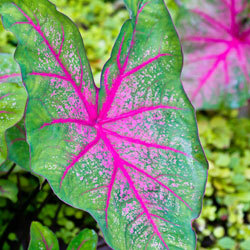 Caladiums: Available in a variety of colors including pink, white, gray, green, red, white, mottled and variegated. These plants flourish in shade with rich soil and regular watering. Callas: This slender plant with large green leaves grows 2-4′ tall. White spath-shaped flowers in spring and early summer rise above the leaves. Grows best in wet soils and light shade. Cannas: Large leaves of green, red or variegated with spectacular flowers of red, orange, yellow, pink or cream in summer and early fall. Tall varieties grow to 6′ and dwarf varieties grow to 3′. Plant in full sun. Chilean Jasmine (Mandevilla laxa): A deciduous vine growing 15′ or higher, this provides an overhead tropical look when grown on a pergola or overhead structure. Very fragrant white flowers in summer add to the tropical effect. Requires rich soil. Gunnera: Huge, dark green, stiff-haired leaves growing to 8′ tall. These “dinosaur food plants” make an amazing statement in the landscape. Requires good soil and ample water. Produces large red cone-shaped flowers. Rose-Mallow or Perennial Hibiscus (Hibiscus moscheutos): An American native, grows as a perennial with many varieties of different sizes and colors. Flowers may grow to 12″ diameter in red, pink or white. Regular fertilizing increases bloom vigor and colors. Rose of Sharon (Hibiscus syriacus): Deciduous shrub growing to 12′ tall but easily trained or kept smaller. Flowers, 2.5-3″, in mid- or late summer. Palms: Nothing says tropical like a palm. Here are four that are readily available and can be used in your garden for a lush accent. Needle Palm (Rhapidophyllum hystrix): Fan palm with short or no trunk, to 6′ tall. Extremely winter hardy. 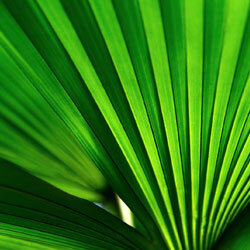 Dwarf Palmetto (Sabal minor): Native to the southeastern United States. Grows 4-6′ tall by 8′ wide. Green or blue-green fan-shaped fronds. Mazari Palm (Nannorrhops ritchiana): Shrubby clumping growth to 6′ tall, bluish-green colored fan fronds. Windmill Palm (Trachycarpus fortunea): Grows to 30′ tall and 10′ wide. 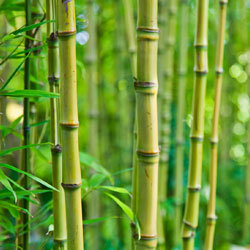 Bamboo: Few plants rival this group of grasses for hardiness, tropical appearance and variation. Both clumping and running bamboos vary in color, height and requirements. From the dwarf to the giant, there’s a bamboo to add tropical pizzazz to your garden. To see the best selections for our growing zone or ask questions about creating a tropical garden, come in and talk with our friendly staff. They can help you make the best selection to put the topical in your garden paradise.